The many members coming together at the same time and place was offset by the persistent rain which led us to find alternate modes of fun. Hence, the parking lot backdrop we used for our meet. Even against the glum weather, the many smiles and laughs made it a great day. Andy suggested Blake pull a fatty burnout to wake the sun from its snooze. Blake answered with the help of some of the team members holding it down. 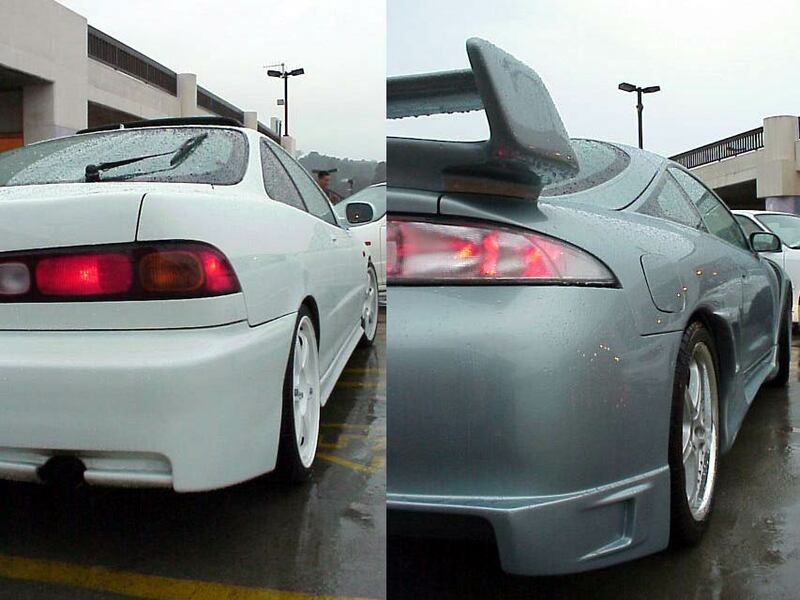 Blake's GSR: Sporting a set of 18" TE37 lightweights matched to Tein Coilovers, this DC2 handles and looks great. Blake let me have the keys to this badboy and I tested it in the Berkeley hill twisties. This was a sports compact that was designed for 15" wheels. 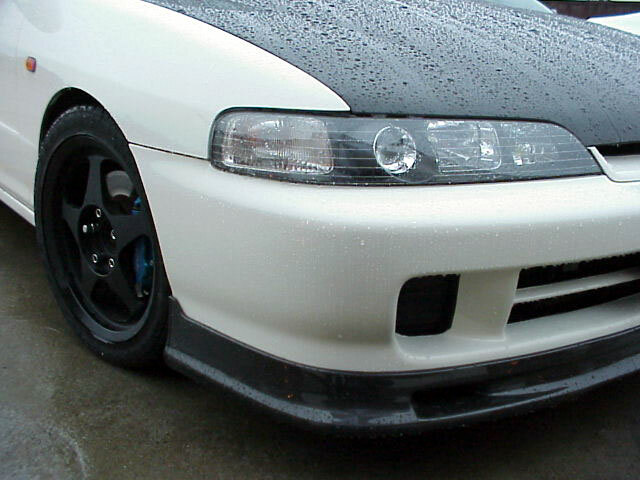 However, with the power-ups, this GSR is perfect for the streets and for the weekend warrior duties - it makes the drivers head snap back and makes others heads turn when the VTEC engages - pop! 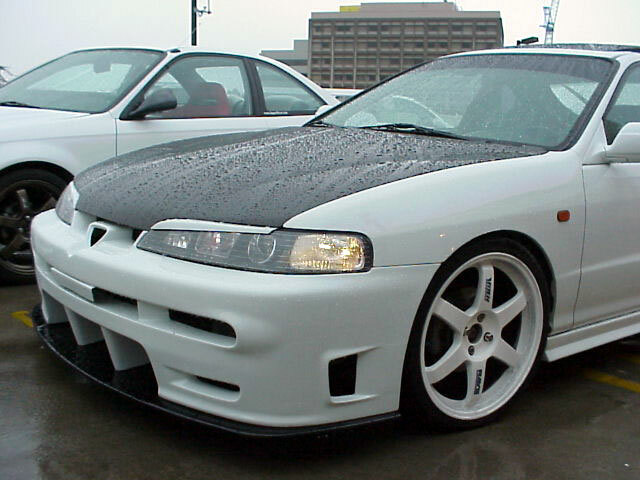 Exterior goodies include a carbon fiber composite hood matched to a rare Zeal R-type Japanese Domestic Market conversion. And to keep it clean, a shaved wing deck lid. 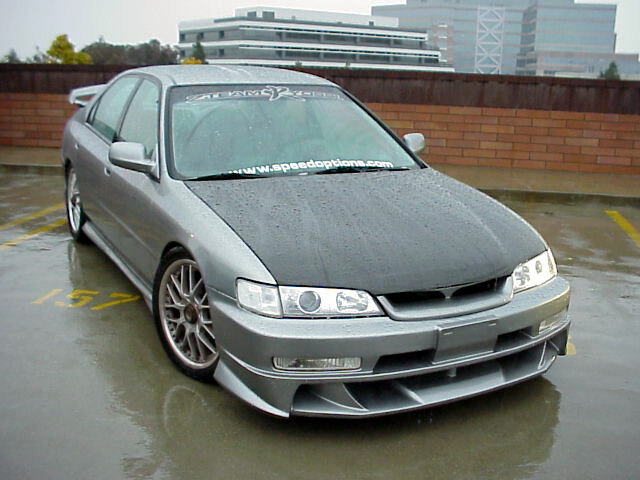 Steve's Accord: Steve drives this sedan everyday to work and school. He rolled up to the photo shoot with a full carload of savages. Can your slammed Honda do that? Azect Xtreme body kit, composite CF hood, 18" 3-piece SSR GP-O, and S2000 gunmetal silver paint. The angular aspect and monochromatic effect of the full metal jacket transforms a family sedan into a mean looker. John's Eclipse: Driven daily to the California state university and work daily driver, John puts on grips of miles. In fact, he's burned through his 6 month old tires already. 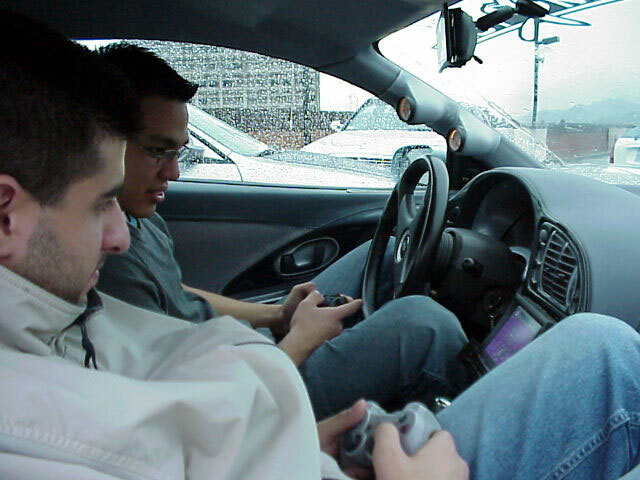 Andy and John were playing Playstation 2 out of the rain. John has a new multimedia system consisting of Playstation 2 and Alpine DVD video - it's Bobby Digital fly. As for the exterior, I'm sure all of you know about his car, it's a trend setter in the extreme class. The flamboyant design of the car might not be for all of you, but it gets props in my books. You see all those cars out there with roof scoops? 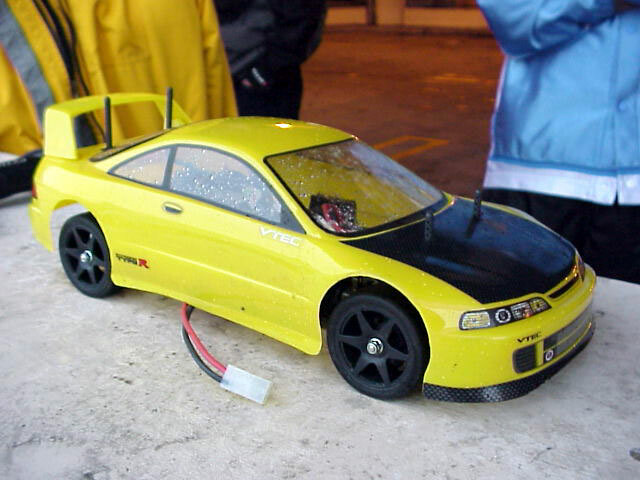 John's car inspired them to do it as he was the first in the scene to do it. 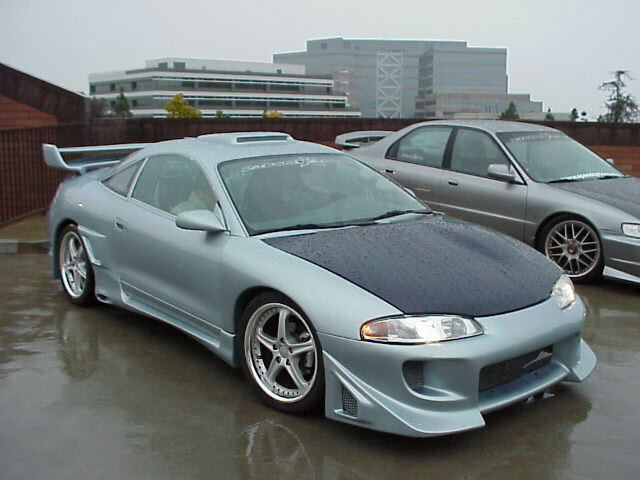 Back in the day he was the first to have a VeilSide styled body kit for the Eclipse as well, soon everyone and their momma had one. Copying is the highest form of flattery. 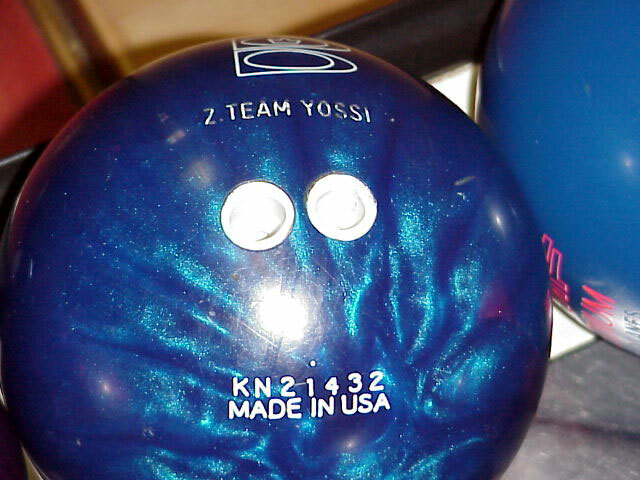 The last picture is John's bowling ball for maximum spin delivery - ZTY, approved. The newest upgrades: Jaguar Ice Blue pearl paint, 18" 3-piece SSR GP-O Evolutions, candy blue carbon fiber hood, and rear disc conversion to match his 3000GT front brakes, chrome dipped and plated. Jon's C230K: It's been a busy year for Jon P. He participated in almost every S.Cal show this year, but he lives in the SF Bay Area. That says a lot about his drive, pun intended. He took home 16 titles this year so far. 19" 3-piece Axis wheels intended for a Ferrari Modena 360 were custom fitted to the Benzo. 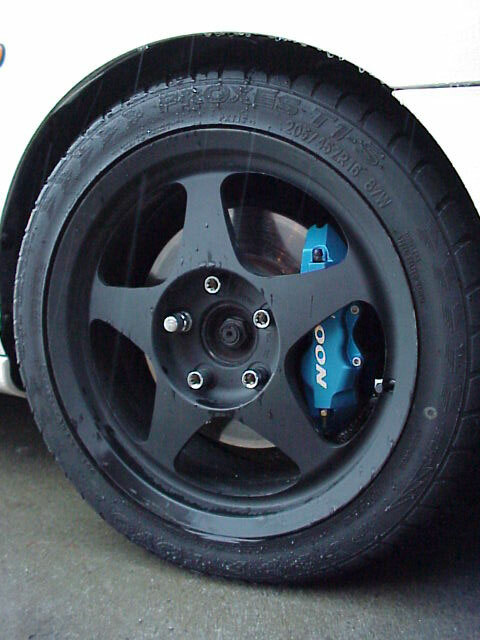 Behind those massive alloys, 13" Porsche brakes at all four corners. 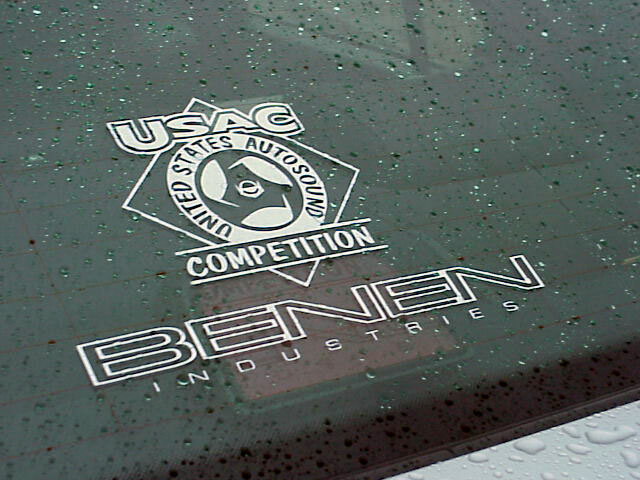 He just took home $1000 Best Euro at SEMA's International Auto Salon and 1st Place in the 1-150 watt stereo competition with his new Pentium 3 DVD full multimedia powered stereo system. 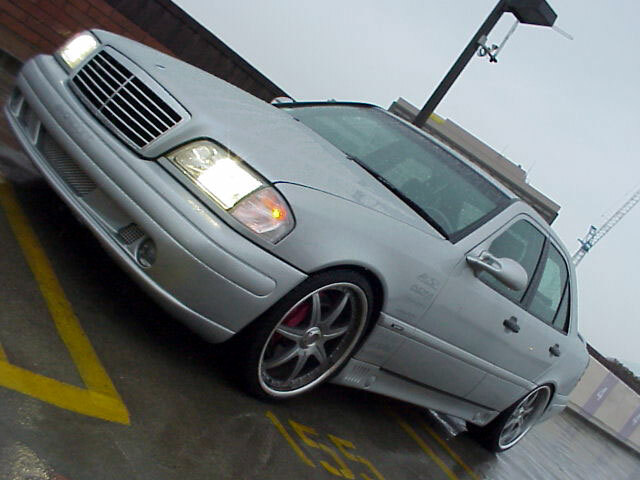 Jon's C230K adds the Luxury Sport Euro flavor to ZTY. With too many mods to list, 2001 is his year in the show circuit. If you haven't heard, they call him Bruce. 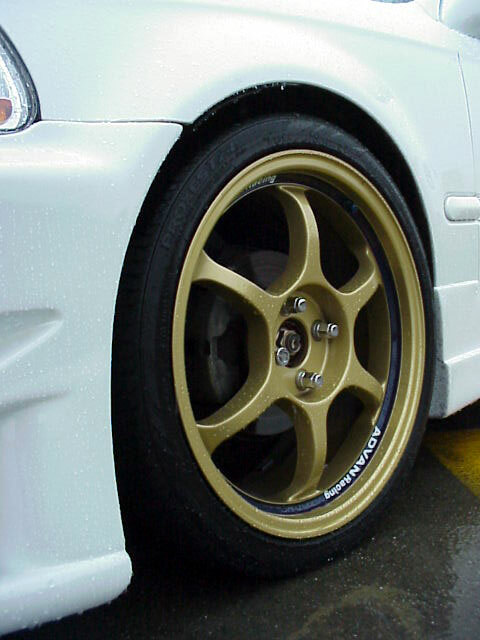 Koji's EK: Buddy Club Civic sporting Advan RG's in racing gold, Tein coilovers, Jun Auto rear wing, Racing Medallion, Sparco Sprint seats, sounds simple and clean huh? Indeed! B-series DOHC VTEC powerplant coming to an engine bay near you. 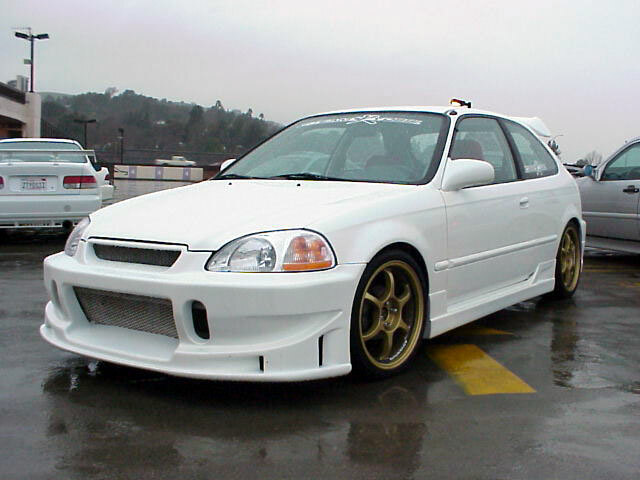 Laurence's Civic: This coupe represents an ideal route for the budget minded enthusiast. 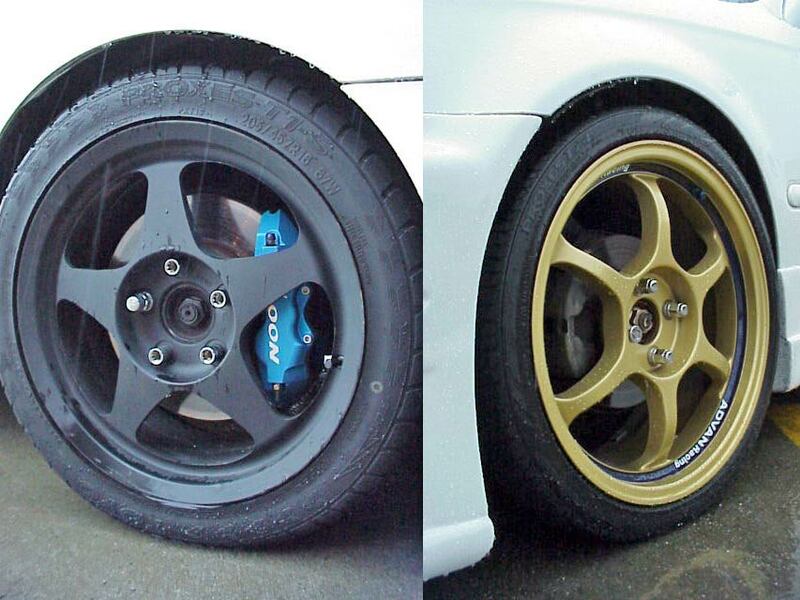 Laurence went with the Mugen body kit and the Volk Racing TE37 bronze clones, saving a grip of money to sacrifice "brand name performance and quality." 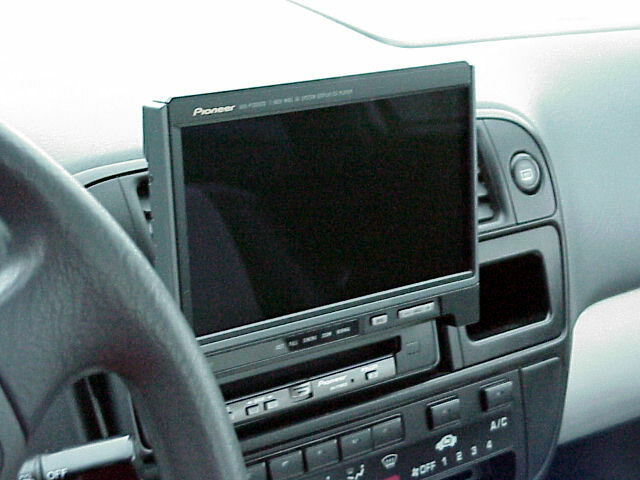 With the saved money, he picked up a new Pioneer wide screen DVD/CD video monitor and a Recaro SRD seat for cross bay commutes to work. ZTY Flagships clockwise from the left side: Michael's Spoon-Spec '98 ITR, John's Multimedia Nitrous Eclipse, Steve's Azect Accord, Jon's Supercharged Multimedia C230, Koji's Buddy Club EK, Laurence's Mugen Civic, and Blake's Zeal Integra GSR. 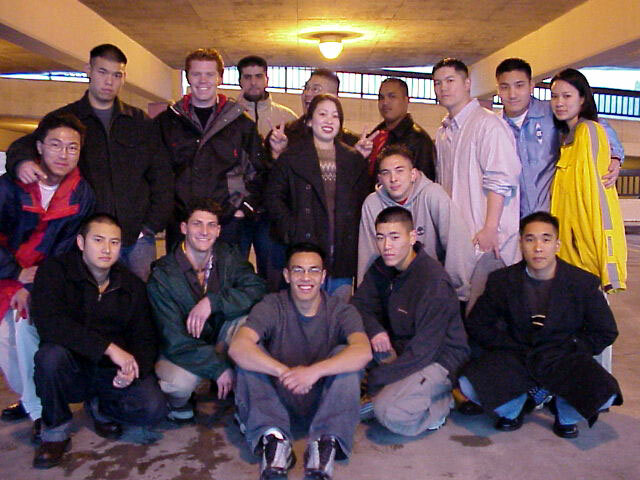 ZTY colleagues: John H, Steve C, Michael Y, Jon P, Laurence X, Blake, Koji M, Jeff J, Andy J, Miles H, Shaun T. ZTY savages: Ian. Diane, Quan and Mike.